The state of Oregon killed two more wolves from a helicopter on April 18th after a "producer" (bureaucrat-speak for rancher) complained about wolf predation. The Fish & Wildlife department issued the kill order after two depredations were confirmed by investigators. On April 11th members of the agency hazing wolves at the scene shot and killed a young female. According to the agency the Pine Creek pack is responsible for five incidents of depredation killing four calves and injuring six, affecting two different livestock producers. The three culled wolves were members of the the Pine Creek pack which now numbers five. One more wolf could be taken by the agency, or a permitee until May 4th. The state has delayed issuing its long-awaited new wolf management plan and is still operating under a management plan first adopted in 2005. At the time of its adoption, wolves in Oregon were federally protected as endangered under the Endangered Species Act. 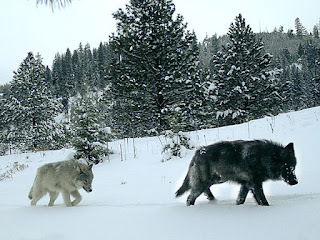 Federal protection for gray wolves in portions of eastern Oregon ended in 2009, but a court case effectively re-established their protected status in 2010. The updated plan requires ranchers to first use non-lethal means of controlling wolf predation. Wolves confirmed to be involved in "chronic depredation" maybe killed by ODFW or a livestock producer who has been issued a permit. One of the stated goals of the plan is to conserve the wolf populations in Oregon. This month the department also issued its wolf count. Despite dire predictions from the livestock industry that wolf numbers would explode unless lethal means were routinely used to reduce wolf numbers, only a modest annual increase of 11% was recorded by biologists. While wolf numbers have increased considerably over the last eight years (only 14 were counted in 2009), depredations and livestock losses have not increased at the same rate. 124 wolves now call Oregon home, living in 12 known packs; eleven of those have breeding pairs. The state also documented wolves living in the northern Cascades for the first time. Thirteen wolf deaths were recorded, twelve caused by humans. One of those mortalities included a wolf trapped and killed in Union County. The poacher was prosecuted and convicted of the illegal taking. He was sentenced to two years probation, fined $1000, and forfeited his gun and trapping gear.